Long before Nashville was on the map as a foodie destination, the Ayala Family and the Oñate Family knew the city held the promise of progress for their new restaurant idea, Las Palmas. They arrived in Music City in 1989 with a mere $3,000 borrowed from friends and family, and a wealth of knowledge from their experiences as cooks and managers in Atlanta’s restaurant scene. They used their savings to purchase an old Mazda to drive all around the southeast, scouting various cities. Within a few months, they had settled into the old 1960s building that housed the Silver Dollar Saloon on Charlotte Pike in Nashville. The building was set for demolition, but with a variety of talents in the family, they were able to completely renovate and remodel the restaurant. This is where Las Palmas began. Las Palmas opened for business on August 20, 1990, passing out flyers, free tacos and sodas to get people in the door. It took 8 long months, but the good news about delicious Mexican fare finally traveled through town. 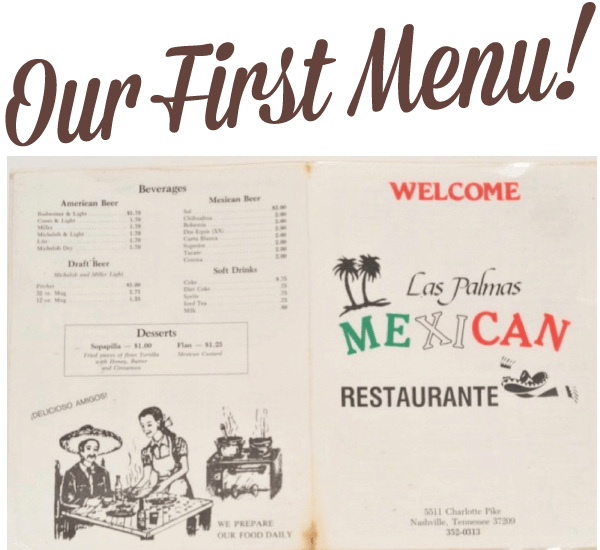 Las Palmas began to find it’s regular and loyal patrons, many who still frequent the restaurant today! The family loves to reminisce about the stories from the old days, such as the little league team that would come in after their baseball games. These players, who now coach their children’s teams, continue the same post-game traditions today. There’s also all the married couples who had their first dates at Las Palmas back in the day. As well as, a particular group of young friends who would gather every Tuesday night to eat, drink and do tricks, such as juggling bowling pins. These friends still gather at Las Palmas, but now they bring their grandchildren! Their authentic Mexican cuisine and family-friendly atmosphere led Las Palmas to become a staple in the Music City food scene. By 2006, the family had opened 9 locations in the Nashville-area, serving the community they love, including celebrities such as Dolly Parton, James Edward Olmos and Tennessee Titans football players. They are proud to employ over 200 employees, many of whom have been with the restaurant for over 15 years.